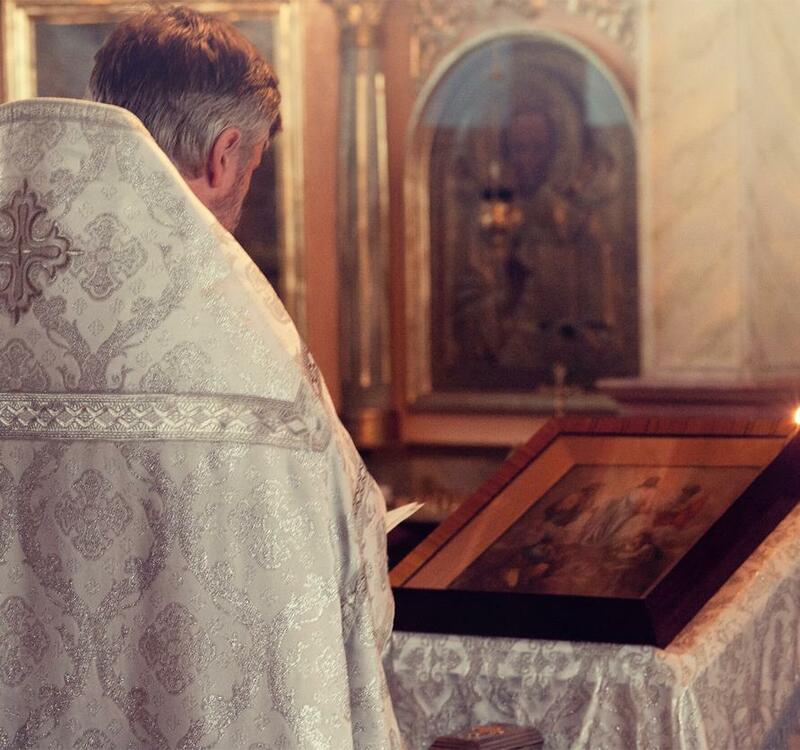 Form a strong sense of morality founded on prayer, communion, sacraments and Word of God. Equip the children with the necessary spiritual foundation to be a missionary. Motivate younger ones to Learn, Love, Live and Proclaim Jesus as the Lord through the Church, in the present US context. Promote growth of faith through knowledge and experiences. The cash award is given to those who student who score 95% or above from 8th -12th grade. Academic excellence awards are given based on the following criteria. Scholarship: The 12th grade student who receive the highest grade will be awarded with Kuriamparambil Scholarship award. In the name of God / I, the catechism student / pledge myself / to be faithful to my call / towards universal brotherhood / and Christian holiness. I love my Church. I am proud of / its rich and varied spiritual heritage. I pledge myself / to abide by the teachings of the Church. I shall attend / the catechism classes regularly. I pledge to respect and honor / the Pope, Major Archbishop / Archbishop / the parish priest / teachers / and my parents. Lord Jesus, bless all of us. Our CCD Program is headed by Rinson John. He has a very versatile staff under him, dedicated towards excellent education and extreme care of our students. We at Syro Malabar Arizona, believe in investing a lot in our children (our future) and want to be a integral part of their spiritual upbringing. Know more about our teachers here. 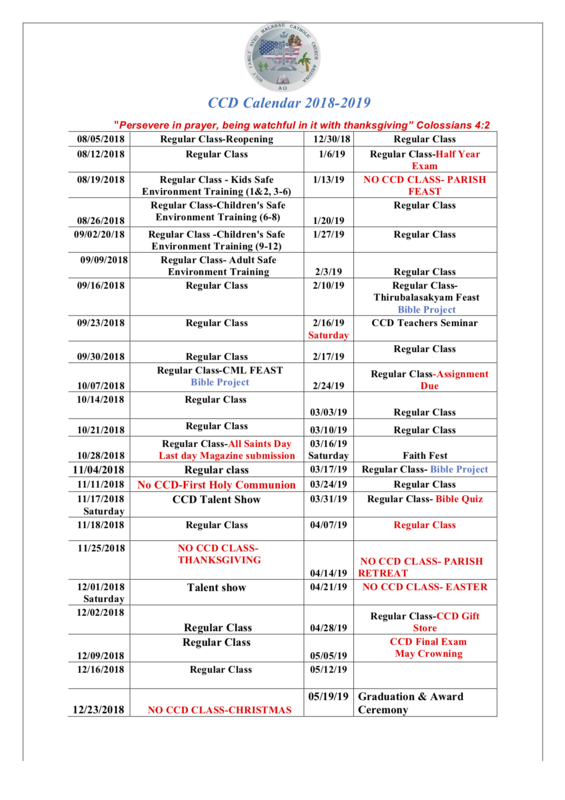 We have classes from Kindergarten to 12th grade. There is also a youth program those who completed 12th grade. There is an assembly at 9:30 am every Sunday. It consists of a prayer song, Catechism Pledge and announcements. Duration of catechism is from 9:30 am to 11:00 am. Kids who are late by 15 minutes is considered tardy. Four tardies considered as one absent. There will be prize for perfect attendance. Each grade has first and second prize for those excel in academic performance. Academic Excellence Prizes (1st and @nd) will be awarded only if the score is 70% or above. All children who score 90% or above in classes 1-4 will be given special prizes. Marks: Exams -70%, Assignments 20%, Church and class participation 10%. There will be two assignments. There is prizes for those who have 100% attendence. Scholarship: There will be cash award for 1st prize in all grades. On every Sunday second reading is done by CCD Kids. Kids who are in 5th grade and up can sign up. Every year we have Bible project for kids through which they learn Bible verses , Prayers and basic teachings of Catholic Church.They will be provided a packet every month worth 20 points. For each point they can earn CCD Dollars which they can use at CCD Gift store to buy special gifts. Click here to download the Question Bank. 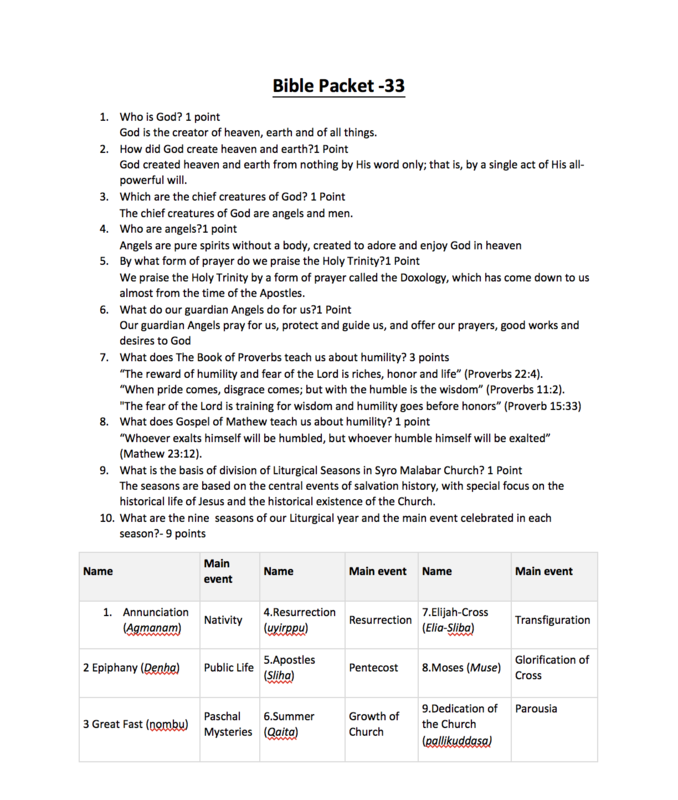 The Bible Packet 33 is due on 02/10/2019. Click here to see the Bible Packet. Kindly encourage kids to study. We have formed a Kids Choir for English Holy Mass. Special training is given to them. There will be special days scheduled for our CCD throughout the year for volunteering at St Mary’s Food Bank and Andre House. Parents and kids can participate according to their convenience in these voluntary activities. Cloth Drive: Cloth drive is conducted in October. All donations are given to St. Vincent De Paul society. Toiletry Drive: It is conducted in February for collecting toiletry items. All donations are given to Homeless. Comprehensive Year long training is given to kids preparing for First Holy communion and Confirmation classes. There will be times in everybody's life when question arise about faith. We have placed a question box in the church hall to place questions regarding faith for parents and children. We have formed a resource team to answer these question. They refer to Bible and church documents to answer questions. All children get an opportunity to dress up like their favorite saint. They learn about that saint and present a summary of that saint's life in the meeting. It is to promote and exhibit the creative works of Children and parents. They can write articles,draw pictures, do paintings etc. We have about 700 books and videos in our CCD Library Bible stories, bible study, Catholic teachings, Saint Biographies, Parenting, Personality and character Formation, Guidance for Teenagers, Problem solving for adults etc. All members of the Parish are welcome to check out books and videos. The library is open every Sunday. Our Library is conducting many programs to promote Christian and value based reading. All children gets points when they read a book, or watch a DVD and return with a hand written summary. If a parent does the same their children get points. This is to improve catholic parenting. When they complete a paper and pen activity which we provide, like puzzle sheet, earn points. Also they can earn points by presenting any handwritten article related to Christianity. We may post that in our library for other kids. Every 100 points children will be rewarded and at the end of the year the top scorers will get special awards. There will be catholic publications and free leaflets. Every Year we conduct a Talent show to provide opportunity for our children to express their individual talents. Kids who received Holy Communion can sign up for Alter Service. Special formation is provided. There are annual sports and prizes will be given to winners. It is a special day devoted to honor Holy Mary.There will be a special procession, prayers, songs and offerings by children. There will be Annual Day celebrations at the end of the year in May. All children are divided in to groups. Each group will present a program on stage. Special classes and discussions are conducted to teachers to grow in faith. Church documents ,various publications and video presentations are given to teachers for this.